Untitled, Ceramic 2008. C Ingrid Pollard. LONDON.- LandFall, an exhibition of new work exploring the Atlantic Ocean as natural phenomenon, transporter of dreams and peoples, opens at Museum of London Docklands on 6 February 2009. The work includes painting, collage, sculpture, textiles, music and poetry and disentangles the complex relationships between Europe, Africa and the Americas, through the tides and traumas of the Ocean. Contributing artists are Beth Secor, Faisal Abdu' Allah, Godfried Donkor, Jamal Cyrus, Ingrid Pollard, Dorothea Smartt, Dominique Le Gendre. Taking the point of 'arrival, the first landfall reached after a long journey' as a point of artistic departure, the LandFall project reflects the artists different approaches to forming new patterns of collaboration with local communities on both sides of the Atlantic. 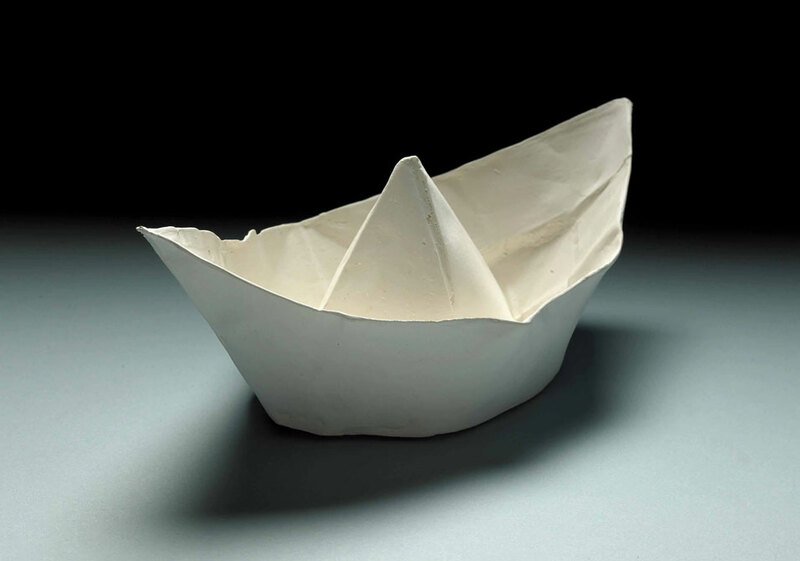 From Ingrid Pollards ceramic casts of origami paper boats, which stretch in a flotilla across the gallery in a disquieting collision of weight and lightness, to Beth Secors extraordinary embroidered portraits in which threads of history and ancestry are tied together into affecting beauty, the works lend themselves to the circular themes of departure and return, loss and transcendence, and explore the ongoing reverberations of the triangular trade in enslaved Africans and sugar, the way it has shaped modern Europe and affected the lives of people of the African diaspora. Jamal Cyrus drawing and photography forges an eclectic criss-crossing of the Atlantic in the wake of the Titanic, pre-Columbian Olmec statues and 1960s funk music, whilst Godfried Donkors re-interpretive collage work explores ideas of beauty in the southern US states. Theres a tidal power in Faisal Abdu Allahs moving portraits, captured in post Katrina New Orleans, and the call of the sea is heard throughout haunting new poems by Dorothea Smartt, which follow Bilal, a boy buried in a plot marked Sambos grave in 1739 Lancaster, and are presented here in video form. The exhibition will feature the world premiere of Dreamwinds, a tone poem for chamber orchestra and voice by renowned composer Dominique Le Gendre. LandFall follows on from the exhibition Tradewinds, the inaugural show in a new display launched within London Sugar and Slavery, the only permanent gallery in London dedicated to exploring the history of the transatlantic slave trade. Co-curated with artist Ingrid Pollard, the LandFall project builds on residencies at Project Row Houses in Houston, Texas and at londonprintworks in 2006, and is supported by the Arts Council.